VOTE FOR VOGT: Aaron and Carolyn Everett, Blake Vogt's grandparents, watched Tuesday night as their grandson, a magician from Lebanon, performed America's Got Talent. 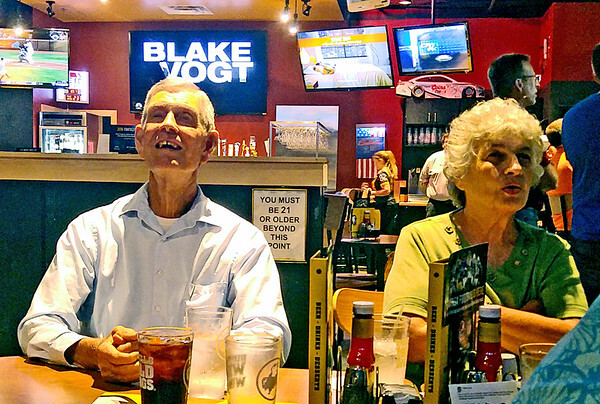 Dozens of Vogt's friends and family watched the live episode together at the Buffalo Wild Wings in Lebanon. Vogt performed several tricks for the show judges, including pulled a playing card from an egg shell. The two-hour show included a short profile of Vogt. A crew filmed the spot at the Everett's farm in June, Carolyn Everett said. Vogt wasn't always quite as talented a magician as he is today. Carolyn Everett said Vogt used to have to pay his brother $1 to get him to sit for Vogt's first shows. Vogt has been rehearsing for most of the last week, but Carolyne Everett said he has had time to talk to them on the phone. "He seems excited," she said.